Located on top of Cape Panwa this hotel commands breathtaking views of its surroundings. * This product is priced in Thailand Baht (THB), AUD rates can fluctuate depending on exchange rates, final rates in AUD will be confirmed by your consultant at time of booking. Prices shown are fully inclusive of taxes unless otherwise stated. Advertised price includes any bonus nights, special offers or discounts listed in the inclusions. Surcharges may apply due to demand, Christmas & New Year's Eve, school or public holidays, trade shows, special events & other unforeseen circumstances. Prices may be based on Dynamic Rates and as such, may fluctuate at anytime without notice, due to matters outside our control, such as adverse currency fluctuations, fuel surcharges, taxes and airfare increases, or at the property's discretion. *Minimum stay of 3 nights required. The 52 villas, which range from spacious one-room pool suites to extravagant five-bedroom villas, are generously positioned around a jungle hillside. All are impressively put-together with clean-lined contemporary furnishings, large bathrooms, dressing rooms and kitchenettes stocked with complimentary beers, juices, and snacks. Private swimming pools range from giant to colossal. Sri Panwa offers one bedroom pool villas, each villa is nestled with its own infinity swimming pool with a jet stream Jacuzzi system, large master bedrooms dressed with the finest linens, an outdoor bathing area with a separate rain shower, steam room and an ocean view pavilion of its own. This type of villa has a beautiful sun deck in between the bedroom and living room which gives the villa extra privacy within your quarters. The living room has it owns small pantry and bathroom and is the ideal place to relax when you need a break from the hot sun, combined with the in-house Bose sound system this area may be the ideal place to spend your afternoons at Sri Panwa. LV-B’s Sri Panwa offers one bedroom pool villas, each villa is nestled with its own infinity swimming pool with a jet stream Jacuzzi system, large master bedrooms dressed with the finest linens, an outdoor bathing area with a separate rain shower, steam room and an ocean view pavilion of its own. The expansive living room is connected to the bedroom but still offers privacy within the villa.Guests can also enjoy the perfect romantic evening in the outdoor sala or on an expansive sofa bed while our state of the art entertainment system provides background music. About 190 sq.m.in size, each one bedroom Family Suite is nestled within its own infinity swimming pool with a jet stream jacuzzi system, an indoor-outdoor living area, dining space, pantry, large master bedroom dressed with the finest linens, an outdoor bathing area with a separate rain shower, a sunset pavilion of its own and state of the art entertainment system. Sri Panwa offers One Bedroom Residence Pool Villas nestled within a larger Three Bedroom Residence Villa to provide guests with incomparable space and utmost privacy. One Bedroom Residence Villas features a large master bedroom dressed with the finest linens, a large private pool an indoor/outdoor bathing area with a separate rain shower and a sunset pavilion of its own. Guests can also enjoy the perfect honeymoon hotel romantic evening in the outdoor sala or on an expansive sofa bed while our state of the art entertainment system provides background music. Sri Panwa offers One Bedroom Pool Villa (PV) Garden View, each villa is nestled with its own infinity swimming pool with a jet stream Jacuzzi system, large master bedrooms dressed with the finest linens, an outdoor bathing area with a separate rain shower and a pavilion of its own. Guests can also enjoy the perfect romantic evening in the outdoor sala or on an expansive sofa bed while our state of the art entertainment system provides background music. For luxurious and stylish living under one roof, One Bedroom Family Suites are spaciously perched along the forest view. Base on a two-person occupancy. About 180 sq.m.in size, each one bedroom Family Suite is nestled within its own swimming pool with a jet stream jacuzzi system, an indoor-outdoor living area, dining space, pantry, large master bedroom dressed with the finest linens, an outdoor bathing area with a separate rain shower, a pavilion of its own and state of the art entertainment system. Located in the heart of Sri Panwa, Luxury Pool Suites offer elegant contemporary furnishings and benefit from stunning sea views, maintaining all the comforts of a pool villa in one space. About 100 sq.m.in size, each pool suite has its own infinity swimming pool with a jet stream Jacuzzi system, large master bedroom dressed with the finest linens and guests can enjoy the perfect romantic evening on the outdoor balcony or on a sofa bed while our state of the art entertainment system provides background music. The pool suites are just steps away from Baba Poolclub Phuket Restaurant and Sri Panwa’s beach. Nestled in the central point of Sri Panwa’s oasis of calm and luxury, the newly completed enclave of Pool Suite offers accommodation of the highest quality, maximum privacy and commanding breathtaking views of the Andaman Ocean and her beautiful sunsets. Each 70 square metres suite is carefully crafted to provide luxury living in our own tropical paradise. Perched atop Sri Panwa’s latest addition to its oasis of calm and luxury, the Penthouses command unparalleled views of the Andaman Ocean from up to 60 metres above sea level. Designed using our signature Tropical Contemporary Theme the westerly facing Penthouse Suites are made up of 140 square metres of refined living space as well as a private infinity pool to enjoy the sunset views. Sri Panwa offers two bedroom pool villas, each luxurious pool villa is nestled with its own infinity swimming pool with a jet stream Jacuzzi system, large master bedrooms dressed with the finest linens, an outdoor bathing area with a separate rain shower, steam room and an ocean view pavilion of its own. Guest can also enjoy the perfect romantic evening in the outdoor sala or on an expansive sofa bed while our state of the art entertainment system provides background music. About 300 – 350 sq.m. in size, the villa offers complete privacy. Designed in a Tropical Contemporary style, both exterior and interior have been crafted to the highest standard and custom-built to follow the natural contours of the cape. Sri Panwa offers two bedrooms, Pool Villas, each villa is nestled with its own infinity swimming pool with a jet stream Jacuzzi system, a large master and guest bedroom dressed with the finest linens, an outdoor bathing area with a separate rain shower and a sunset pavilion of its own. Guests can also enjoy the perfect romantic evening in the outdoor sala or on an expansive sofa bed while our state of the art entertainment system provides background music. For luxurious hip hotel and stylish living under one roof, Two Bedroom Family Suites are spaciously perched along the Western Peninsula commanding breathtaking views of the spectacular sunset and several islands dotted along the Andaman Ocean’s horizon. Sri Panwa luxury accommodation in Phuket offers Two Bedroom Pool Villas nestled within a larger Four Bedroom Residence Villa to provide guests with incomparable space and utmost privacy. Two Bedroom Residence Villas features a large master bedroom dressed with the finest linens, a large private pool an indoor/outdoor bathing area with a separate rain shower and a sunset pavilion of its own. Guests can also enjoy the perfect romantic evening in the outdoor sala or on an expansive sofa bed while our state of the art entertainment system provides background music. For luxurious and stylish living under one roof, Two Bedroom Family Suite ( FS ) Garden View, about 350 sq.m.in size, feature two bedrooms on one level separated by an open air spacious living area complete with a kitchen, dining space, expansive sofa bed, loungers and an infinity pool with a jet stream jacuzzi system. Two large master bedrooms dressed with the finest linens await indoors, along with a bathing area with a separate outdoor rain shower and a state of the art BOSE entertainment system. For stylish living and exquisite entertaining under one roof, Sri Panwa luxury resort offers Three Bedroom Residence Luxury Villa Rentals to accommodate groups of friends or large families. Each luxurious villa is nestled with its own infinity swimming pool with a jet stream Jacuzzi system, large master & guest bedrooms dressed with the finest linens, an indoor/outdoor bathing area with a separate rain shower and a sunset pavilion of its own. Guest can also enjoy the perfect chic hotel Phuket romantic evening lounging in the outdoor sala or on an expansive sofa bed while our state of the art entertainment system provides background music. For stylish living and exquisite entertaining under one roof, Sri Panwa grand hotel Phuket offers Four Bedroom luxury residence villas comprising a large infinity pool and absolutely private incomparable indoor and outdoor living space of up to 1600 sq.m. 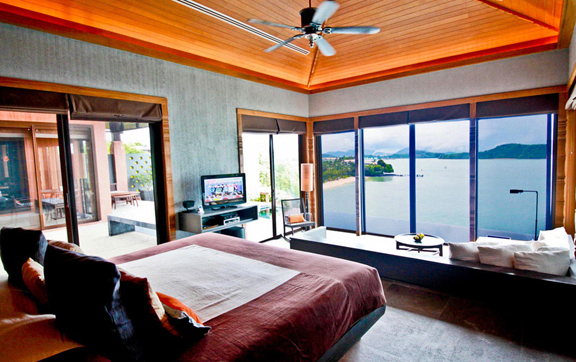 overlooking dramatic sunsets views of the surrounding islands and the aquamarine the Andaman Sea. Designed in a tropical contemporary style, both exterior and interior have been crafted to the highest standard and custom-built to follow the natural contours of the Panwa cape. 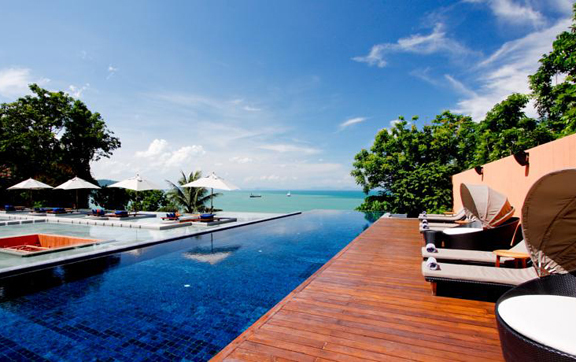 Sri Panwa top 10 luxury hotel Thailand offer five bedroom residence villa is well suited to a family group or friends. The Villa, complete with a master bedroom, four guest bedrooms, and a large infinity pool reflect the Tropical Contemporary style Sri Panwa embodies. 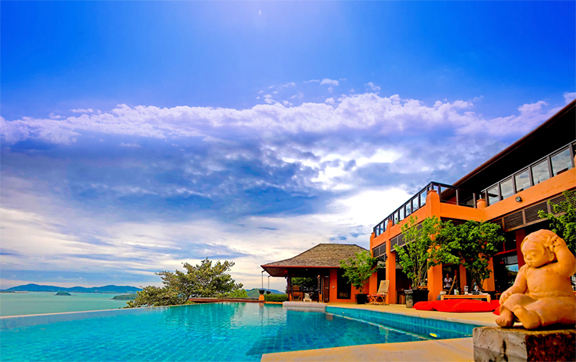 With its gifts of sight, light, smell and sound, the villa overlooks the Western Peninsula commanding dramatic sunsets and spectacular breathtaking views of the surrounding islands and the aquamarine the Andaman Sea. Nestled in the heart of 40 acres of privately owned lush jungle surroundings, this Five Bedroom Residence Villa are a soul-soothing and sympathetic blend of modern and luxurious minimalist interior decor built on one of the globe’s most beautiful coastlines. Sri Panwa is a mixed development offering one to two bedroom Pool Villas and three to five bedroom Villas for Sale. Scattered within 40 acres of lush, tropical surroundings and offering accommodation of the highest quality, maximum privacy, and superior service. Perched on one of the globe’s most beautiful coastlines, Sri Panwa was awarded the World’s hotel with the best views by Beach Tomato UK and voted among the top 3 Beach Bars worldwide by CNNGo, 2011. All pool villas offer panoramic ocean views, while some boast full and uninterrupted 300° ocean views. Sri Panwa is an oasis of calm and luxury in one of the finest locations in Phuket Thailand. Spectacular island, Andaman Ocean, sunrise & sunset views are part of everyday life here at Sri Panwa, the luxury hotel in Phuket. The hotel is located in the far south-east of the island, around a one-hour drive from the airport and 15 minutes from Phuket Old Town. There’s not a great deal going on in the immediate area – although sailors will appreciate all the nearby water-based options – so you might want to hire a car if you’re planning on exploring the island. Split-level decking, nautically-playful stripy sofas and a series of square and rectangular pools form an expansive adult play space at the top of the main building. Here is where you’ll find the bar, BabaQ restaurant, which serves Thai and International favourites throughout the day, and Baba Hotpot, the hotel’s cookery school. A buggy ride will take you to Baba Soul Food and Baba Nest, a stunning rooftop bar that appears to float out from the hillside – bag a spot on a beanbag at 5.30pm and watch the cherry-red sun set over the craggy coastline. Cool, Spa Phuket Top 10 Luxury Spa Destination in Phuket at Sri Panwa Luxury Resort Phuket. Immerse your mind, body, and spirit in an extraordinary sensory experience totally secluded within the rainforest high above the Andaman Sea overlooking Phuket’s Archipelago. Reflecting its ocean location, the tranquil Cool spa draws creative inspiration from tropical contemporary designs, bringing the sights and sounds of the sea indoors. Cool Spa services offer a five sense experience within four extremely spacious treatment rooms, a private salon, and a floating yoga deck – all of which enjoy panoramic ocean views. Enjoy complimentary use of our nature inspired facilities including the infinity pool that creates the illusion of being afloat between sea and sky. Bask in Cool Spa’s tranquility and serenity that embraces and envelops your entire being and embark on a journey of self-rediscovery.